Body By Science by Dr Doug McGuff and John Little. Ryan Hall contributed to Chapters 3 and 8 regarding genetics. This is Part 2. For Part 1, which I highly recommend you listen to first, please click here. Please note – In this episode, I talk about my confusion around effective diets for optimal body composition. I’ve since found that Ted Naiman’s recent presentation on Insulin Resistance (coupled with our recent discussion – coming soon!) has been incredibly helpful in providing some clarity! The studies Ryan mentioned will be added to this blog post at a later date. Examples where Ryan has individualised the exercise stimulus for the individual to address things like genotype, fatigue response, fiber type distribution, etc. Ryan’s thoughts on effective exercise cadence. How to objectively measure progress and specifically improvements in strength. The importance of the negative component of the exercise. The value in using HIIT alongside HIT and how to apply it effectively. How to train for performance, an expansion on The Ideal Training Program for Athletes, Chapter 10 in Body By Science. Fat loss and diet protocols. I enjoyed this podcast as well as the last one with Ryan. I’m a bit doubtful of some of the diet info and metabolic advantage claims (of the ketogenic diet) but oh well. I really liked the training info in both podcasts (should I be more doubtful, lol, since I have more knowledge about nutrition vs. exercise phys?). Anyway, well done LN! Cheers Thomas. The studies I posted in the selected links might be helpful. Also, if you haven’t already, consider watching Ted Naiman’s insulin resistance presentation (also in this blog post at the top). Ryan, last week I send you a mail with a specific question, maybe it’s catched in your spam or you haven’t time to answer(yet). Anyway, see when it fits to answer or not. Regarding TUL at Kieser, the newer standard is 90-120 seconds. For great part based on recommendation of Dr. Toigo, who also spoke at the Kieser convention in Dresden 2015. The reason is that it seems that the growth stimulation/protein synthese is stronger after reaching failure in 120 seconds compared to say 30 – 60 seconds. Another reason is better form up to failure. 30 % and experimented with different TUL all to utterly shaking failure. 70-75 seconds feels overall best for me. Taking into account a few more reps for optimal disc squeese/unsqueese. Ad, I’m sorry I haven’t been able to respond to your email yet. The number of messages I received through email and social media has been overwhelming. Don’t get me wrong, I appreciate every questions and comment and enjoy talking shop. It is just taking me a while to crank through all of the messages. That goes for anyone else who has messaged me. I have flagged all emails and will respond to everyone. Thanks for answering Ryan. I understand fully. Ad, the recommendations they are making are most likely for an average. Jones’ research showed that there are a few individuals who are outliers. As I spoke about in this episode, the TUL will also be determined by the range of motion for a particular exercise, the speed of movement, and the subject’s innate motor ability. There are some subjects that lose form with heavier loads and others who do not. That would fall under the motor ability category. It could also be psychological. Stick to the TUL that works best for you. Continued strength gains are the best objective measurement of improvement. Keep me informed of your progress. 1. I don’t think the discussion about metabolic fitness is as black and white as it’s portrayed. There was discussion of myself and Luke Carlson being more endurance based because of our higher volume workouts and his marathon running and my triathlon. For clarity, I think I’ve done 4 total triathlons inc. a super-sprint at the World Champs in London, 2013, and a half iron-man last year. This is something I dabble in for fun – I don’t believe I’m built for this. I’m not sure where Luke stands on this comment, but I can say that Luke is not built like a prototypical marathon runner! I definitely think some people can handle higher higher volume, and others will struggle beyond 4 exercises, but I don’t think this is completely representative of their muscle fibre distribution, or predetermined metabolic pathways. I think there are key psychological factors, notably a discomfort element which are not being considered here. A better marker might be the reduction in load in later exercises compared to if they were done ‘fresh’. 2. There was mention of the book titled “The Lumbar Spine, The Cervical Spine and The Knee” by Arthur Jones but it wasn’t ever ‘named’ – this is the book that has data on strength testing. A great read, unquestionably. 3. I don’t believe the evidence supports that eccentric training is essential for hypertrophy. and since this redirects in to consideration of timed isometrics and body-weight training, the paper I’ll cite here is by Maeo, et al. (2014) in Eur J Appl Physiol – “Neuromuscular adaptations following 12-week maximal co-contraction training”. Basically, participants performed maximal bicep and tricep contraction with their elbows bent at 90 degrees, 3 days/week for 12 weeks (10 maximal reps (4 seconds) x 5 sets). Muscle thickness increased by ~4% in both biceps and triceps. Agreed these were untrained participants, but it suggests that the mechanisms for hypertrophy are not movement dependent. In my 2013 paper “Evidence-based resistance training recommendations for muscular hypertrophy I actually review the area of muscle actions and there is quite a lot of data supporting increases in CSA from concentric only actions. Brad Schoenfeld (a previous speaker) wrote a paper titled “The Mechanisms of Muscle Hypertrophy and their application to Resistance Training” (J Strength Cond Res). He clarifies quite nicely the potential signalling pathways that cause satellite cell proliferation and ultimately that lead to increased muscle hypertrophy. Another great paper worth looking at is by Marco Toigo in Eur J Appl Physiol (2006) “New fundamental resistance exercise determinants of molecular and cellular muscle adaptations”. 4. I agree wholeheartedly about specificity. The worst thing S&C coaches ever did is think they knew about sports specificity. They’ve probably set world records back decades by hindering specific motor mechanics. That’s an exaggeration but you get my point. 5. Interestingly, the comments below mention Marco at the Kieser Congress in Dresden, 2015. I was there as a speaker and Marco is a great guy and very interesting speaker but I also don’t think there’s any evidence to suggest optimal TUL. What I really did like is Ryan’s mention of the cam in the engine and the segmentation of movement. I also think people are WAY too bogged down with super-slow and repetition duration and agree completely with Ryan that these discussions seem to never consider the exercise; e.g. a pull-over vs. abduction which have vastly different ranges of motion. 1. I don’t think the discussion about metabolic fitness is as black and white as it’s portrayed. There was discussion of myself and Luke Carlson being more endurance based because of our higher volume workouts and his marathon running and my triathlon. For clarity, I think I’ve done 4 total triathlons inc a supersprint at the World Champs in London, 2013, and a half ironman last year. This is something I dabble in for fun – I don’t believe I’m built for this. I’m not sure where Luke stands on this comment, but I can say that Luke is not built like a prototypical marathon runner! I definitely think some people can handle higher higher volume, and other will struggle, but I don’t think this is completely representative of their muscle fibre distribution, or predetermined metabolic pathways. I think there are key psychological factors, notably a discomfort element. 3. I don’t believe the evidence supports that eccentric training is essential for hypertrophy. and since this redirects in to consideration of timed isometrics and bodyweight training, the paper I’ll cite here is by Maeo, et al. (2014) in Eur J Appl Physiol – “Neuromuscular adaptations following 12-week maximal co-contraction training”. Basically, participants performed maximal bicep and tricep contraction with their elbows bent at 90 degrees, 3 days/week for 12 weeks (10 maximal reps (4 seconds) x 5 sets). Muscle thickness increased by ~4% in both biceps and triceps. Agreed these were untrained participants, but it suggests that the mechanisms for hypertrophy are not movement dependent. In my 2013 paper “Evidence-based resistance training recommendations for muscular hypertrophy I actually review the area of muscle actions and there is quite a lot of data supporting increases in CSA from concentric only actions. Brad Schoenfeld (a previous speaker) wrote a paper titled “The Mechanisms of Muscle Hypertrophy and their application to Resistance Training” (J Strength Cond Res). He clarifies quite nicely the potential signalling pathways that cause satellite cell proliferation and ultimately that lead to increased muscle hypertrophy. Another great paper worth looking at is by Marco Toigo in Eur J Appl Physiol (2006) “New fundamental resistance exercise determinants of molecular and cellular muscle adaptations”. Thank you for sharing James and for enriching this discussion. 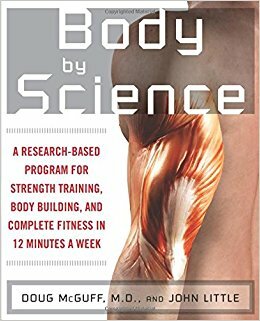 At around the 58 minute mark Ryan mentions a book by Arthur Jones on strength testing, and that this book is available. Is that linked anywhere in here? I really like the emphasis on controlled, intense contractions. I enjoyed this podcast as much as the first…another great one. I was wondering what Ryan’s thoughts were with regards to training for those of us that are more or less in the middle of the glycolitic / oxidative spectrum? In his opinion is there more scope for the majority of us in the middle of the spectrum, for what might work, than there is for the outliers at either end? Could there be a wider range of reps used or TUL employed for those of us in the middle, than those at the ends? Also with regards to testing to find out muscle fibre types, and places on the spectrum, is this test as viable as the one that Ryan spoke about ( using 80% of 1RM )? I ask as this seems a bit safer to perform than trying to do a 1RM with most trainees. I think it largely comes down to individual differences, some people feel great and will move around more on KD, some people will feel sluggish and lose performance – even after an adaptation period. After working with a few thousand clients I have seen both ends of the spectrum, and I hope in the future we will get better tools to figure out what someone responds better to (through gene testing) than just trial-and-error. I haven’t found the research used by e.g. DNAFit to be very compelling yet. I agree re individual variability. Exciting what the future may hold. Just got through these two episodes, fantastic. Thank you sir. These 2 were very popular indeed! Ryan is ace.